I deeply value our veterans’ service to this country. It is an honor to work at the Institute for Veterans and Military Families at Syracuse University. One veteran in particular has inspired me since my childhood. His name is Thomas L. Garrett. He is my hero, my best friend and my grandfather. Thomas is a WWII veteran who served in the United States Navy, Navy Reserves, the United States Army and the National Guard. In total, he has provided 42 years of service to our country. Thomas L. Garrett was a Machinist Mate in the Navy and in the Reserves. 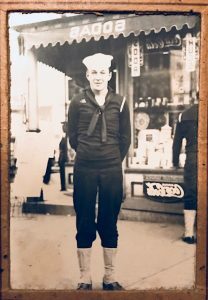 In 1945, during WWII, he was the crane operator on his ship in Guam. In 1950, he was activated in the Army for the Korean War. 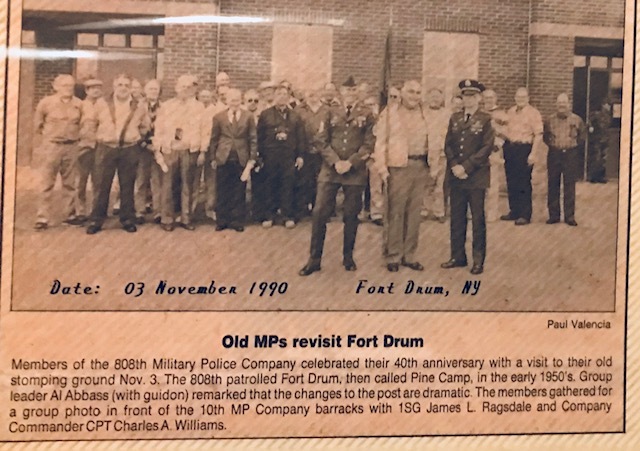 He was a military police officer and stationed at Pine Camp, known today as Fort Drum, NY. 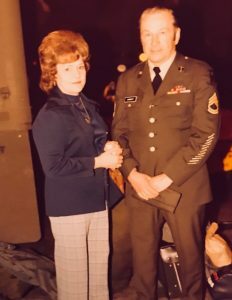 In the National Guard, he was a warehouse man and trained in Germany. After WWII, he pursued flight school as a hobby using his GI Bill to fund his training. He parachuted quite often and flew multiple land planes for recreation. My hero is also a survivor. He has survived the heartbreaking loss of my grandmother (his wife of 65 years). She passed on June 14, 2013 from a 10-year battle with Alzheimer’s disease. He was her primary care provider. Just months after she had passed; his son (my dad) was diagnosed with cancer. My father passed on January 29, 2015. My grandfather became his own hero as he struggled with these losses but remained resilient. My grandfather is still serving his country today. He continues to give to those who are in need. He connects to his military past through written and historical archives that he has built since his time in service. He enjoys researching on the Internet (mostly to connect with other veterans) and reading. Thomas L. Garrett will be 90 this January. He is proud of his service to this country and most of all his never-ending commitment to his community and family. When I shared with him what I do as the Program Coordinator for the Onward to Opportunity-Veterans Career Transition Program he told me he was impressed to see such a beneficial program in place to help transitioning service members and their families. He disclosed to me he was only out of the Navy for a few short days and was so lost in transit with what to do next in his career that he decided to seek out a recruiter and join the Army. He told me that programs like Onward to Opportunity-VCTP did not exist and the expectation was to figure life out after the military on his own. Serving our country was his career pathway and it proved to be the best fit for him. I want to thank our veterans for their service to this country. It is humbling to be associated with the Schultz Family Foundation, JP Morgan & Chase and the generous patrons who continue to support our mission at the IVMF. Having a career that allows me to give back daily to those who have served is truly a blessing and a way for me to continue to honor my hero.